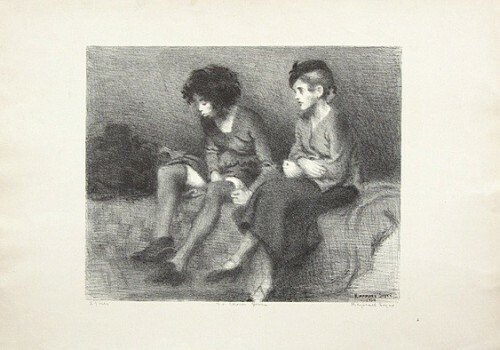 Two Girls, 1934, Lithograph on ivory wove paper, 10 7/8 x 13 1/2"
Chaim Gross with Model, 1928, Oil on canvas, 14x18"
Self Portrait, c.1920, Lithograph, second state, on ivory wave paper, 8 7/8 x 6 1/8"
Susan (Model Susan Leonard), 1929, Oil on canvas, 24 x 20"
Raphael Soyer's life existed in two vital locations, the metropolis of early 20th century Manhattan and in his personal studio. Both of these environments were essentially of synonymous importance for the career of a seminal American painter. 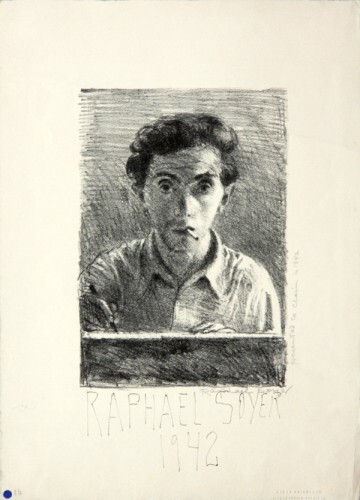 Soyer considered himself to be a "realist and humanist in the arts." His work echoes the tenets of Social Realism a movement prevalent during the Great Depression that focused on social conditions in an industrialized America. Soyer took a personal approach to painting scenes of New York daily life. It was inside the artist's studio where he would reflect what he saw. His studio was also a place for friends and relatives to come together. Soyer devoted a great deal of energy to document his studio setting because it was vital to his life. Raphael Soyer was born in 1899 in Borisoglebsk, Tambov, a southern province of Russia. His family that included five siblings (his twin brother Moses and younger brother Issac were both painters) immigrated to the United States. They settled in the Bronx in 1912 to escape Russian Oppression. 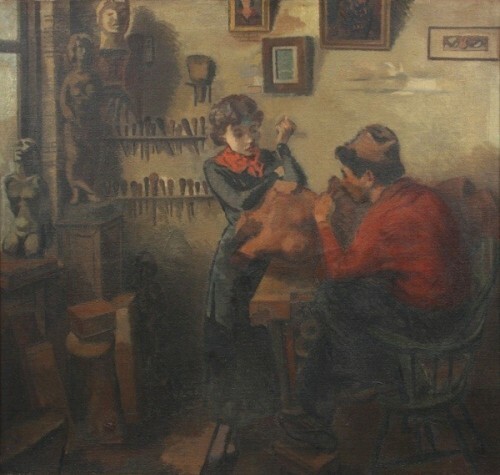 Soyer received a free art education at the Cooper Union and also studied art at the National Academy of Design and the Art Students League of New York. He became influenced in a style of American Social Realism that combined lestists politics with the gritty urban subjects of the Ashcan school. 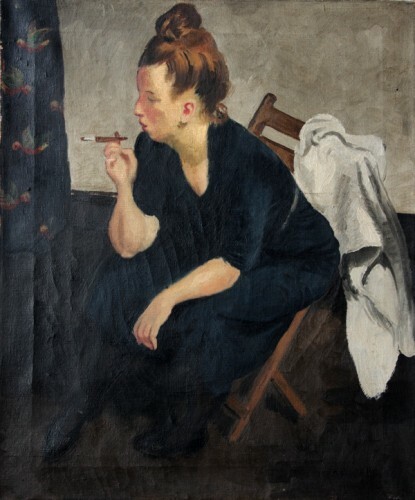 In an intimate exhibition at the Renee and Chaim Gross Foundation, the studio work of Raphael Soyer is presented in a new light. Personal portraits of his subjects are the majority of the exhibition although there are a few sketches for some group and street scenes. We are told a story of an American painter who finds his voice amongst a creative scene that included his life long friend Chaim Gross his twin brother Moses, Chaim Gross, Nicolai Giborvsky, and Saul Berman, who all have work in this exhibition. 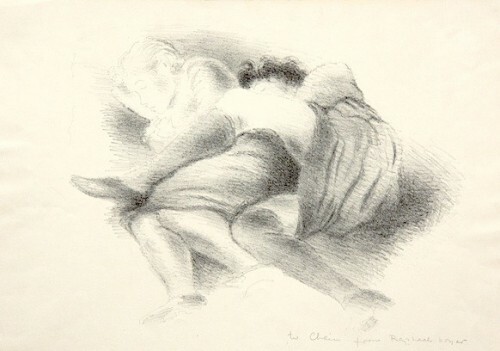 His acquaintance with Gitel Poznanski, Greenwich Village regular and later a Columbia educated Anthropologist, and Susan Leonard who was a well-known model at the Art Student's League are also shown through paintings and drawings. 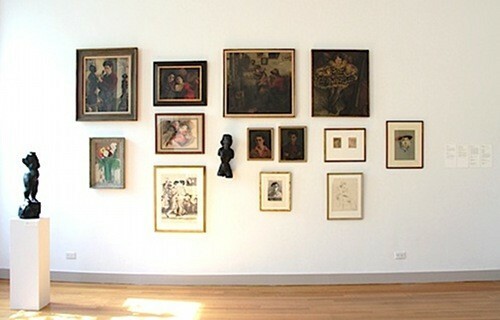 The documentation of friends and relatives through paint is similar to the way we take snapshots on digital cameras. The need to document and remember fragmentations and occurrences in our lives is innate to human nature. The model and reality are both addressed with equal significance. 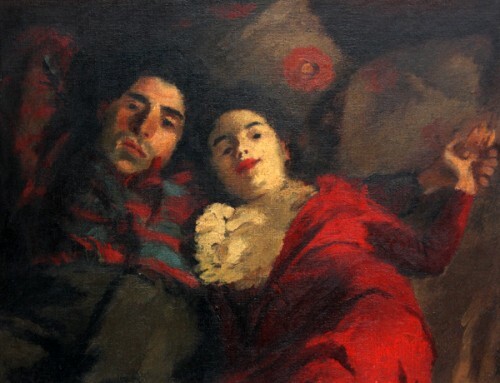 Soyer's depictions of the figure don't romanticize his subject. Very skillfully he was able to capture the moment and expression of what he witnessed through astute observation and participation. He focuses on moments of ordinary significance, moments that exist in daily life. These themes might not strike one as "significant" for the subject of paintings, but when Soyer painted these images their utmost importance is obvious. Images this personal are not often seen by the public. We are fortunate that the Renee and Chaim Gross Foundation decided to arrange and present many of these works for the first time. The work of Soyer and his contemporaries gives us insight towards what was happening before the United States exploded internationally and economically. It shows American life as a "melting pot," founded by immigrants who like the immigrants of today provide a vast and valuable contribution to our collective culture. These artists were influential in forming a stable for artistic experimentation and individuality that inspired future generations of American modernist painters. Unfortunately, the prevailing New York artistic movements have marginalized Soyer and his contemporaries. It is absurd that their works are not on constant view in major New York City museums, especially those that center on American Art or Modernism. One may only speculate reasons for this. We might strongly infer that it was because during this time our country was the closest it had been to social reform and communal culture. During the Great Depression President Franklin Delano Roosevelt put in place many strong public programs to benefit the arts, education, jobs and economic relief for all Americans. These programs were countered by Wall Street and financial interests which have little interest in the arts or the well being of individuals. Social Realism and artists like Soyer and his contemporaries presented a poignant view of their contemporary life during an era of hard times. Their poignant and insightful humanism is all the more relevant as yet again Americans struggle with two foreign wars, at enormous costs, massive unemployments, devastating erosion of life savings and forclosures on homes. The modest, understated paintings of Soyer resonate deeply amidst the clash and clatter of contemporary life.